Home Archive by category "Alpaca"
Sukrita has been doing lots of experimenting lately. 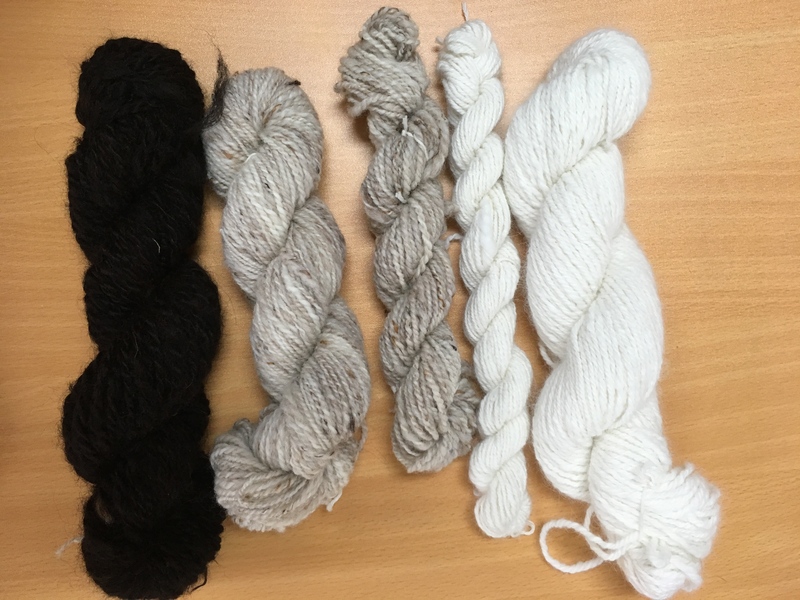 From left to right, these are angora traditional 3-ply, angora Navajo plied, wool spindle spun and wheel plied for the next two, then alpaca on the right. 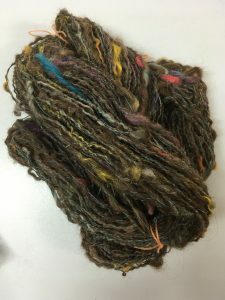 Sukrita’s latest handspun skein contains sari silk and alpaca fibres. Gorgeous. Joanna’s latest handspun and hand dyed skein is still fresh on the niddy-noddy. The yarn is wool and alpaca, with one single being hand-carded to blend and the other single is tops. Here is Deb’s latest hand dyeing effort. 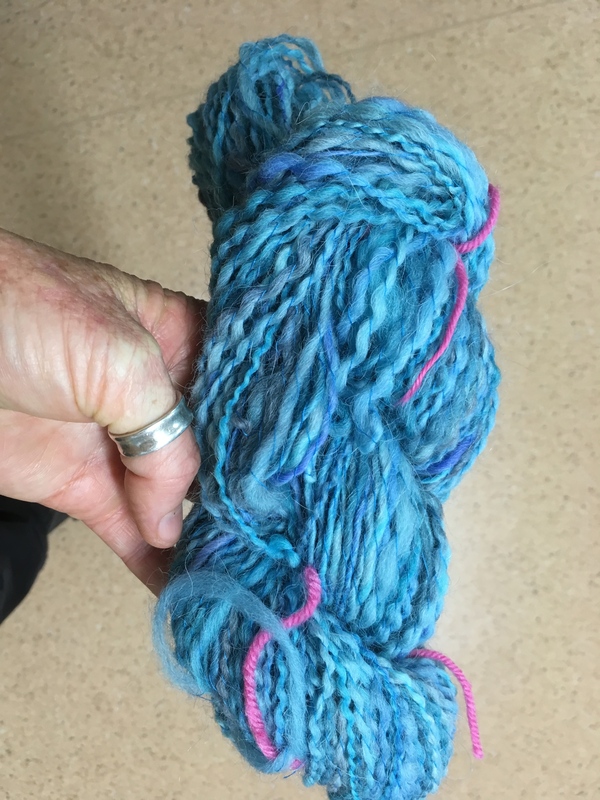 Some beautiful blue handspun alpaca. 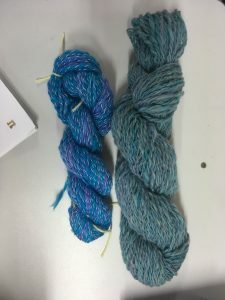 Here are a couple of our Tuesday ladies’ skeins. 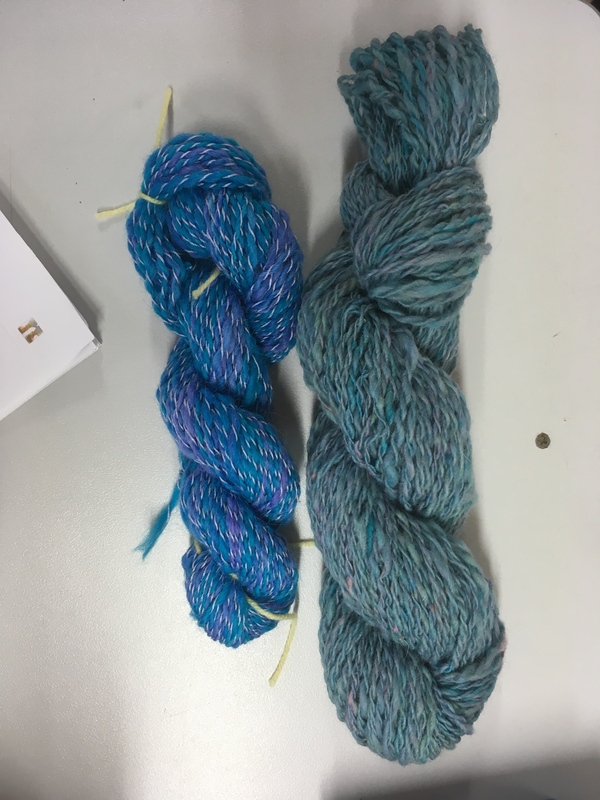 The one on the left is alpaca dyed by Deb and spun by Katie. 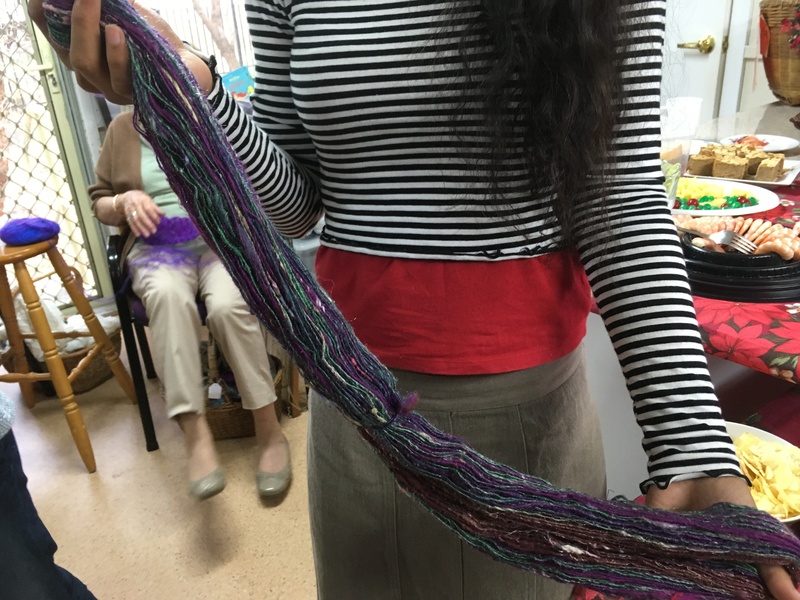 The one on the right is wool that was dyed and carded by Olive and spun by Naomi. What a team effort. Donna brought in all of her recent spinning to show us. What a great achievement. 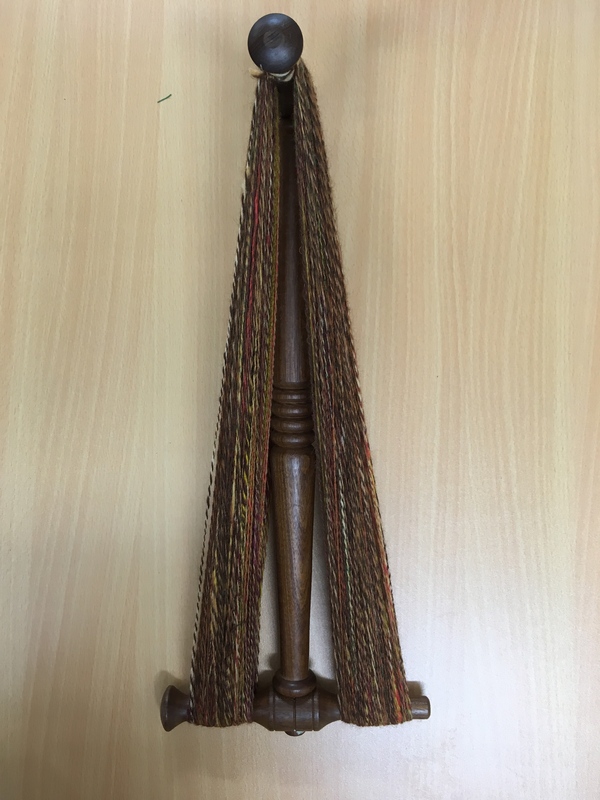 Donna loves spinning alpaca and prefers it to spinning wool so most of her handspun is alpaca. Very nice. The blue scarf on the left is a wool and alpaca handspun that has been plied with cotton. 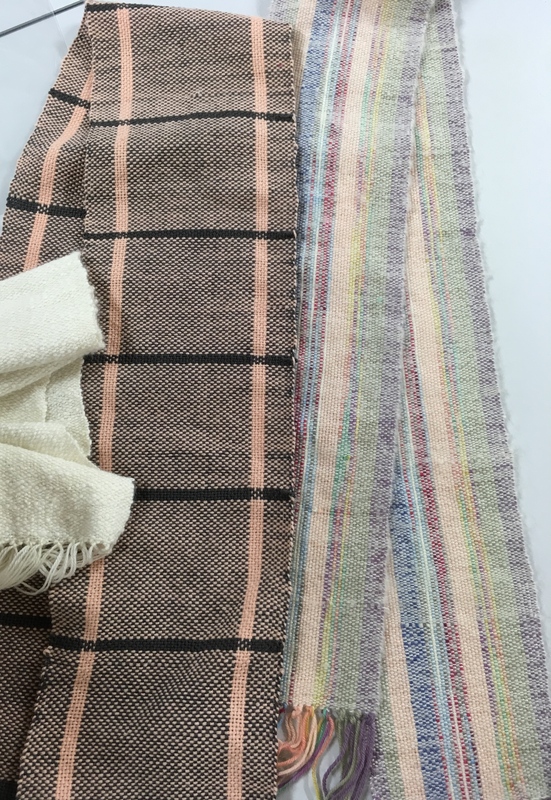 The two brightly coloured scarves are made using our harlequin handspun as the weft – one with a black cotton warp and one with brown. The brown scarf is made using Denise’s first handspun wool. 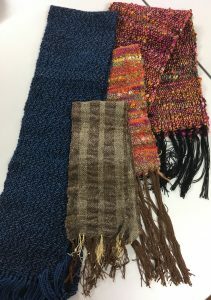 A great selection of scarves from Denise. 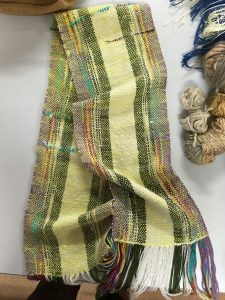 For the above scarf, Faye used an assortment of coloured commercial wools for the warp, and some handspun, hand-dyed wool for the weft. 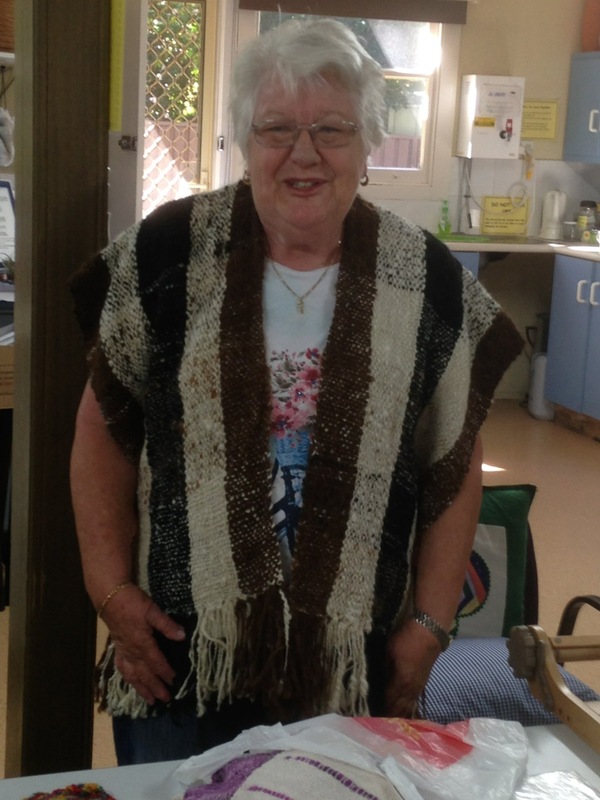 Faye has only tried dyeing a couple of times so what a great result. 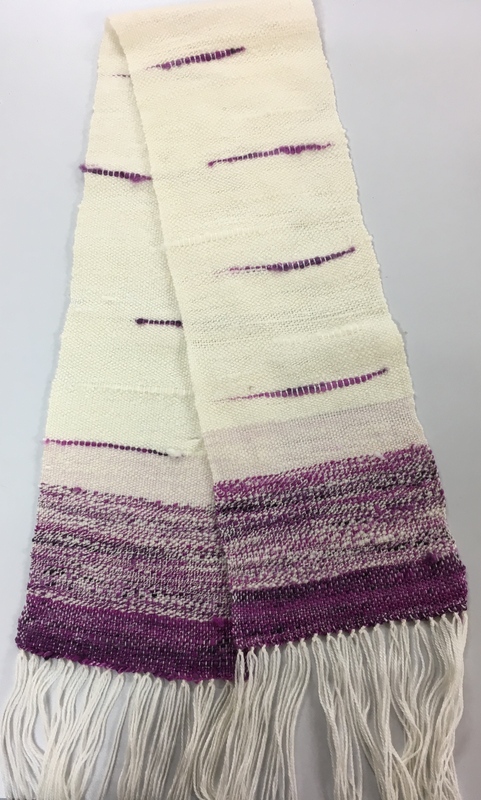 The white scarf has a tencel warp and the weft is angora and baby alpaca. 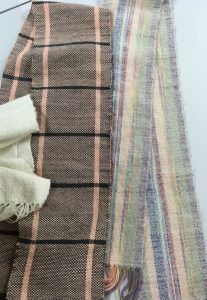 The middle scarf is made from commercial wool, and the scarf on the right has a commercial wool warp and a mohair weft. 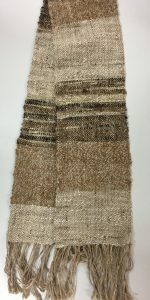 I love the effect that the mohair gives to the weaving. 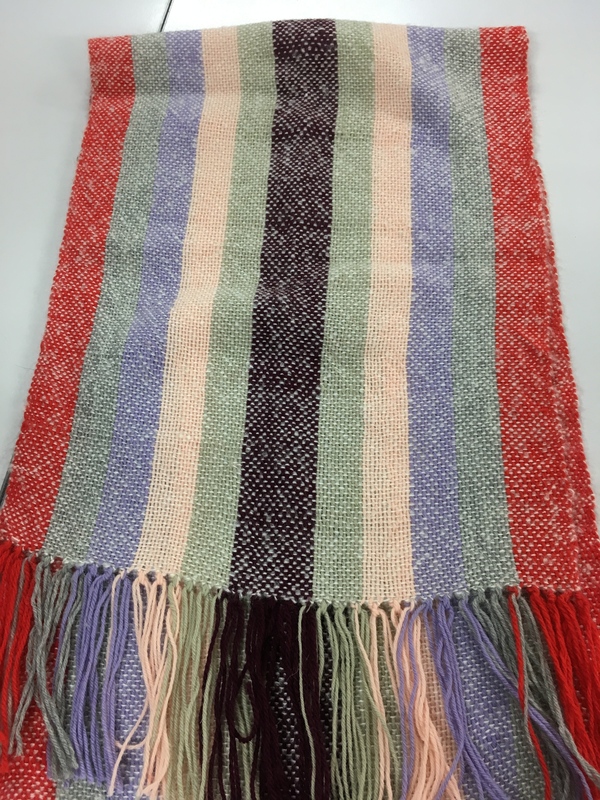 This one has a tencel warp and a handspun weft. So many beautiful scarves by Faye. 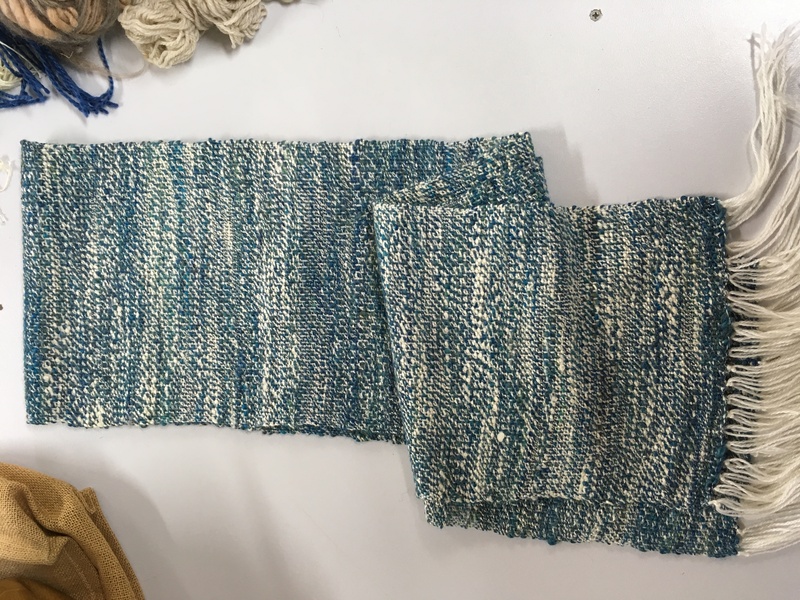 Here we have Faye’s latest weavings. 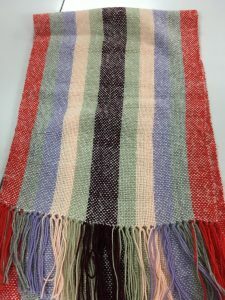 The first is a shawl using commercial wool for the warp and mohair for the weft. The mohair makes it so nice and fluffy. The second item is another of Faye’s lovely scarves. It has a handspun warp of alpaca and the weft is handspun alpaca and tencel. 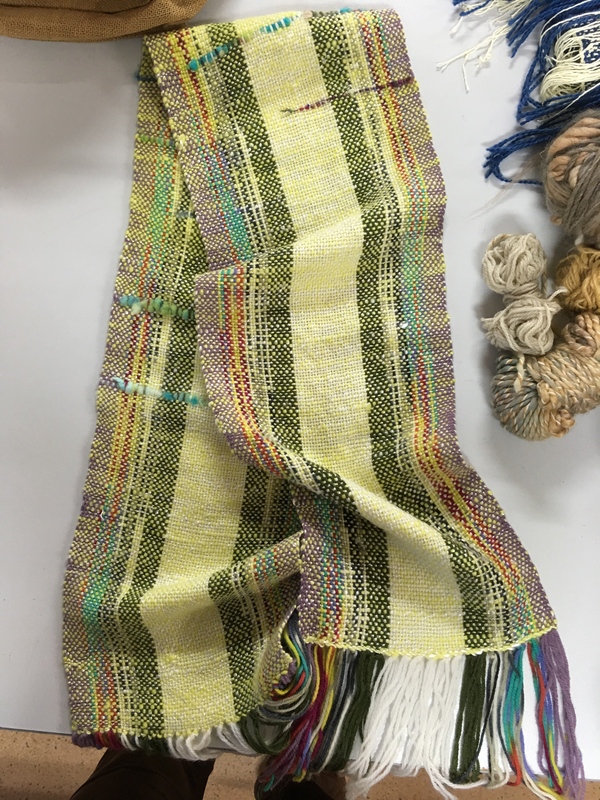 This scarf is made using tencel for the warp, and wool from Lindy Boschler for the weft. More lovely work by Faye. This vest is a real masterpiece. It looks fabulous on Faye. 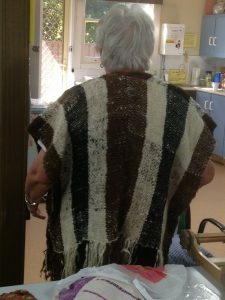 She wove the fabric especially for the vest in two separate panels, joined together at the back with two leather buttons on the sides. 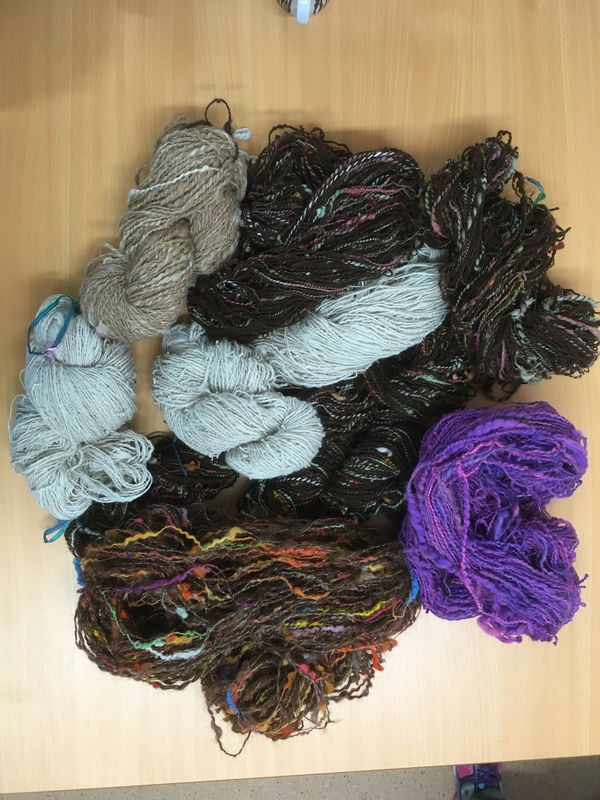 The fibre is a mixture of wool and alpaca. The vest was woven on a knitters loom and of all hand spun fibre. Beautiful work Faye. By Lyn A.